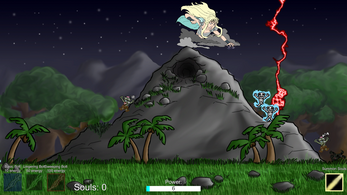 As the Goddess of Lightning, defend your Special Cave against hordes of the undead. Experience the thrill of using an entire 3 - yes, 3 - different colours of lightning bolt! Move with A and D or the arrow keys. Fire bolts with keys 1, 2, and 3. Collect Souls with the spacebar. The souls don't do anything, they're just there as a scoring system system. How many can you collect by the end of the game? Since the web version is restricted to 1280x720, it is recommended that you download the standalone version for the best graphics. This game was made in 72 hours for Ludum Dare 39 by Jimmy Cushnie, Brooke Morgan and Sierra Spoar. Extract the zipped file and run the executable.